MINI Life in Charleston: Where Have I Been??? Ou est Mathieu? Here I am! I have been here all along, just very very busy-busy-busy! We had a CRAZY end of the month at the dealership, delivering seven new MINI's to their new owners yesterday alone! Needless to say I have been under a little stress. This past Sunday was British Car Day at Marion Square in downtown Charleston. We had an absolute blast! I can't wait for next year! Thanks to Stephanie NeSmith for coming-up from Savannah to participate. More on BCD later . . .
Well, you would think I would have a lot to say, but I don't really. I have been so caught-up with work recently that I haven't thought about much else. Oh, look for a post later today on pricing and options for the new 2007 MINI! Very exciting! 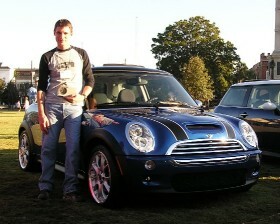 Also, check-out a great video review of the 2007 Cooper S here.